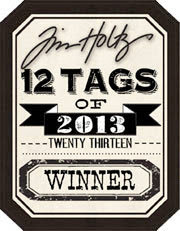 I've not been a good girl in following along with the Tim Holtz Tags of 2013. I only did one up to now. 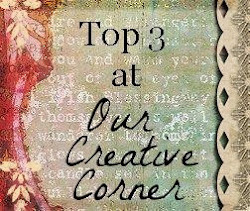 Which is partly due to the fact that I only found the Tim Holtz blog in march this year, but also due to the fact that I don't like being told what to do. I'm also very bad at doing exactly what people tell me to do. Specially when it comes to doing things for fun. 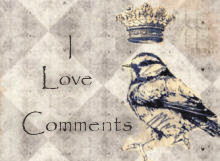 I do, however, like learning cool new techniques, so that is the reason I wanted to try and follow along. I didn't have most of the things Tim uses for his tag and as I didn't want to go out and buy them, but still wanted to stay close to the tag Tim made, I made them myself, sort of. So here's my tag for may 2013. I made the embellishments myself from soda cans and plastic packaging (cool way to recycle). The metal bits were made using Sizzix die cuts. The filmstrip was drawn onto an acetate strip with a permanent marker. After which I scratched it somewhat and used sepia archival ink to give it an older feel. Some more close ups of the tag. As you can see, I'm also preparing to follow along in the 4th anniversary ATC swap next week at the Stamping ground, but as this would be my first swap type thing, I'm not completely sure what is required. Ah well, I guess I will find out along the way. For now I wish you a wonderful day, over here the sun has come out to play, so I think I will go out for a bit. If you have any questions, just let me know. I know my daughter has been telling me to make a youtube video, so maybe I'll do a tutorial on making the fimstrip. Or if you have anything you would like to see, just give me a shout. I don't know the Tim Holtz tag, but what I know is that yours is adorable! I really love it! Your tag is beautiful! I love that you make your own embellishments! Awesome! This tag is mazing,beautiful colors. What a pretty take on Tim's May tag! Love those colors and design! Cool sentiment! Have fun! Super mooie tag Monique met prachtige kleuren en details. Thank you all for your sweet comments. Oh Wow, wonderful Tag, I love it.